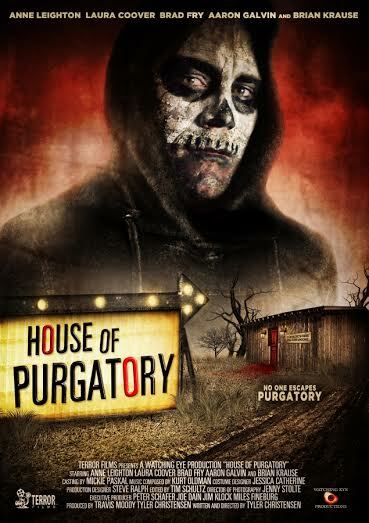 In September of 2015, genre distributor, Terror Films announced it had acquired Worldwide rights to the horror film, 'HOUSE OF PURGATORY' by first time writer/director Tyler Christensen. The film stars Brian Krause (best known for his eight-season portrayal of “Leo Wyatt” on Charmed), Anne Leighton (CBS’ Criminal Minds) and Laura Coover (ABC’s How To Get Away With Murder) and is about four mid-western teenagers who go looking for a fabled haunted house on Halloween night. Once finding it, they slowly realize that the house is much more than a run-of-the-mill Halloween attraction - somehow the house knows each of their deepest secrets. One-by-one the house uses these secrets against the terrified teens, who soon find themselves in a battle to save not only their lives, but also their very souls. Terror Films Executive Jim Klock came across 'HOUSE OF PURGATORY' at Fear Fete Horror Film Festival where it was an official selection and star Anne Leighton was nominated for Best Actress in a feature. The film also screened at Los Angeles' Shriekfest. The film will have a wide ancillary release, currently set for this Autumn. Exact dates for the release will be announced soon, followed by exclusive clips. In the meantime, check out the official trailer (below) and poster (above) for the film.